Despite famous chains like Hard Rock Café and Planet Hollywood declining in popularity, experts still think that themed restaurants will be sticking around for a while yet. The trick to creating an excellent themed restaurant isn’t as complicated as some people might think. In the end, success comes down to basic restaurant essentials: good food and excellent service. Once that’s taken care of, elements like entertainment and surroundings are an extra draw – though memorable customer experiences can certainly make an eatery stand out from the crowd. Here’s a look at 15 bizarre themed food joints from around the world – places where every day is dress-up day and strange and creative designs are king. 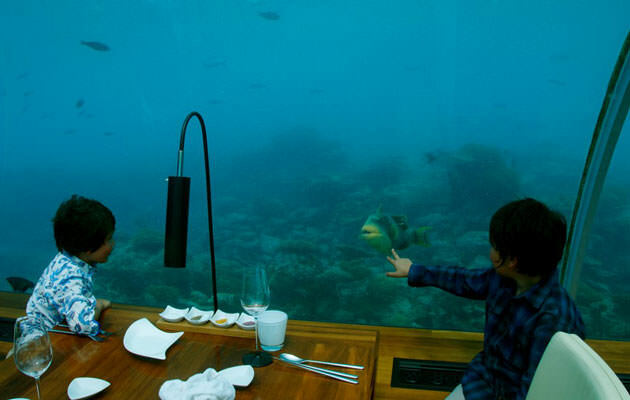 The first ever undersea restaurant, Ithaa in Maldives is located 16 feet into the sea. A person can enjoy a panoramic view of the ocean right in front of his eyes without the need of any kind of oceanic equipment. Created from acrylic with a transparent roof, the restaurant also transforms into a hotel depending on the number of diners on a particular day. While it can be rented for wedding receptions and other social events, it plays host to a rather small number of guests. Ithaa can be accessed via ferry leading to an enclosed spiral staircase directed towards the restaurant. Undoubtedly, Ithaa offers a magnificent view of what underwater goodness looks like in all its glory.